'Cause That Fake Jesus Church is for SUCKERS I Tell 'Ya! | Do Try This at Home: 'Cause That Fake Jesus Church is for SUCKERS I Tell 'Ya! I love ridiculous signs. This may take a bit of explaining but around 30 years ago a church in suburban Melbourne had a sign out the front that said - "What would you do if Jesus came to Hawthorn." And some wag wrote "Move Peter Hudson to Centre Half Forward. Now for those not versed in the niceties of Australian Rules Football, Peter Hudson played the position of full forward and was the leading goalkicker every season he played. What does it say under the name of the church? What are they hiding? You sure your task wasn't to go over the multiplication table with him rather than just make him think about it? I followed your link because I had no idea who this guy was. If I say "Country," does it offend you, because it's actually "Americana"? I don't know much about this stuff. There are gorgeous-out rules, but only if you live in a place that hardly has nice days. We have a hot summer and a cold winter, and a gorgeous day and a half, so these rules do apply. We had the gorgeous out rule as well. And I'm going to inflict it on my boy as well. And since we live in a place where it's gorgeous about 300 days a year, the boy's going to be spending a lot of time outside! Or maybe we do? Mom do we need thought control? 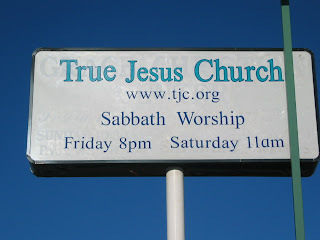 Psst the fake Jesus churches are synagogues no? I had no idea that thought control was in the contract. I'm going to have to find and re-read mine - I'm not sure I was granted that kind of power. It's about 15 F here now ... but tomorrow it will be 51. I don't know if it'll be gorgeous, sunshine-wise, but I'll be out. Yeah, I think the lines between Americana and Country can get a little blurry. But seriously, seriously give an all the way through listen to "She Left Me For Jesus." I'm thinking at least one of the differences between country & americana is that country wouldn't tolerate Hayes Carll, regardless of whether Hayes Carll would tolerate country. And on the outside on gorgeous days - I didn't know there was a limit to the number of days! I thought it was the rules no matter what!!!!! And I have a fairly broad view of what constitutes gorgeous, so it's lucky I have a job where I'm outside at least for a half hour a day. Glad to see you're still finding amusing signs! Love the thought police thing. So I have to assume that in Geroge Orwell's next novel, instead of 'Big Brother', you will be the central charactor known as 'Big Mother'.......thought controlling her flock? ....and by the way...I am the "One True Blogger"...in case anyone asks. That is the weirdest homework ever. Teacher HAD to mean for him to say them out loud...I bet he was thinking about Pokemon or something, lol! Alf - I can't help it! They're everywhere! Thanks Kerry! That's so sweet!!! Bruce - I dunno, I try and watch my fat and calories...just y'know...I'd like to remain medium sized mother if I can help it. :-) :-) :-) I'm kidding, very funny! Lara - and a pain in the neck! I mean, the kid is already better at multiplication than I ever was anyway. I'm starting to think that Houston must have more than its share of ridiculous signs! Arizaphale - You know, from reading the description I thought that we were sort of randomly assigned, but the longer I look at your blog, the more I think you must be right about the pairing! :-) I love your description of the "Why we're here". I wish I had known that one when my kids were littler!!! !